One of the earliest maps to specifically name Miami. 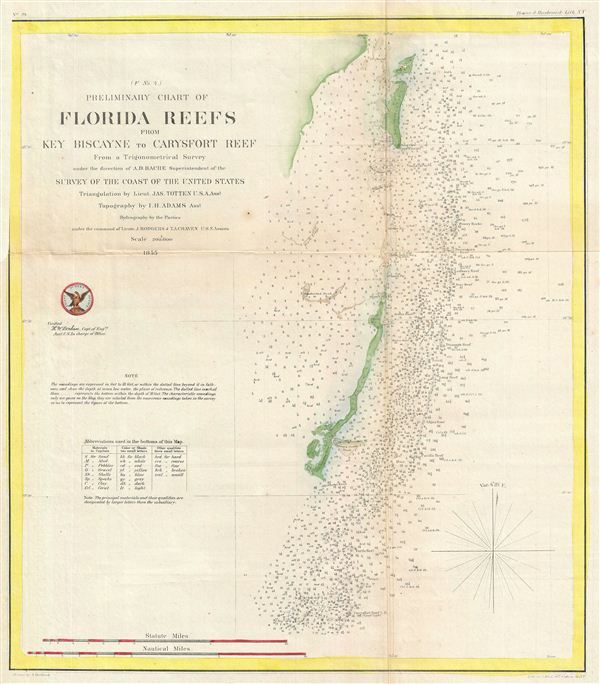 Preliminary Chart of Florida Reefs from Key Biscayne to Carysfort Reef from a Trigonometrical Survey. An uncommon 1855 nautical chart or maritime map Key Biscayne, near Miami, Florida. This map covers from Virginia Key south as far as elliott's Key and Old Rhodes Key, inclusive of Key Biscayne. Miami appears at the very top of the chart – making this one of the earliest maps to specifically name Miami. There are countless depth soundings throughout. Drawn on a scale of 1:200,000. The triangulation for this chart was completed by Jas. Totten. The topography is the work of J. H. Adams. The hydrography was accomplished by a party under the command of J. Rodgers and T. A. Craven. The whole was compiled under the exacting direction of A. D. Bache, Superintendent of the Coast Survey. Very good. Slight toning on folds. Original fold lines. Closed verso repair extending less than one centimeter in center. Original fold lines. Blank on verso.